BURNABY, B.C. – If you’re looking for differences between this Toronto Raptors team and iterations of the recent past, look no further than where they’ve set their internal expectations. On Monday morning, as the team held its annual media day, each player was asked what the goal was for this coming season. One by one they answered with a single word, a word the Raptors probably used more in that four-hour span than they had over some entire seasons that preceded it. The word: Championship. “Sixty [wins]? I’m talking about championship,” said Norman Powell. “Just for us to win the NBA championship,” OG Anunoby echoed. “Go out there and play basketball, win as many games as possible, and at the end of the year hold up that trophy,” Kyle Lowry said. There’s no beating around the bush now. They’ve set their sights as high as it gets in professional sports, and why shouldn’t they? The Raptors have been knocking on the door in the East for years. The dude that’s been standing in their – and everyone else’s – way, LeBron James, has left the conference. While all of that should inspire confidence, Toronto also has a pair of incoming players that know a thing or two about what it takes to win at the highest level. If they’re finally going to get over the hump, make it out of the East and compete for a title, they will certainly need Kawhi Leonard and Danny Green to help them do it, both on and off the court. From a tangible, basketball standpoint we know what the two former Spurs can bring. Leonard, when healthy, is a legitimate superstar. He’s a top-5 calibre NBA player, perennial MVP candidate, and one of the best perimeter defenders the league has ever seen. Green is a career 40 per cent three-point shooter and is one year removed from being named to the NBA All-Defensive second team. However, between the two of them, they also come to Toronto with a couple of championship rings and several seasons of playing under legendary coach Gregg Popovich and alongside three future hall-of-famers – Tim Duncan, Tony Parker and Manu Ginobili – in San Antonio. That experience and the winning pedigree those guys bring could be every bit as valuable to the Raptors – one of the league’s youngest teams last year. It’s no secret that the Raptors are playing for April, May and – if everything goes according to plan – for June. It’s also no secret that they’ve had a tendency to come apart at that time of the year, getting swept out of the playoffs in three of the last four seasons. In trading for Leonard and Green, they upgraded their level of talent, which should go a long way, of course. But their hope is they’ve also added a couple of guys that can lead them to where they want to go. Training camp is only two days old, but Nurse is already noticing the impact of his new veterans. Of the two, Green has been more vocal, to no surprise, but Leonard has a presence about him and has elevated the level of competition in practice, even winning the toy WWE championship belt Toronto’s revamped coaching staff has been awarding to the best player in various drills. They bring a different perspective, coming from one of the truly elite franchises in pro sports. Toronto, like just about every other team in the NBA, has great admiration for what the Spurs have accomplished over the last two decades. 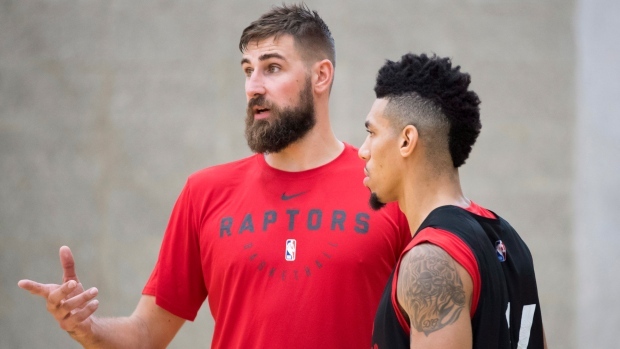 So, as you can imagine, Raptors players – especially the younger ones – have been eager to pick the brains of their new teammates. The biggest thing he learned from the Duncan-Parker-Ginobili trio in San Antonio was the important of staying level-headed over the course of a long season – not getting too high or too low. He learned how to be disciplined and what it meant to be a professional. Perhaps most importantly, he learned how to stick together as a team and help his teammates grow, occasionally through constructive criticism, without making waves – a.k.a the Spurs way. Those are the things Green wants to impart on his new teammates. He’s not going to force it on them, understanding that many of the Raptors players are vets in their own right, but even if it means leading by example these are small details that could make a big difference when they start to rub off.